A Trip to the San Antonio Zoo! The San Antonio Zoo is a non-profit organization that has been open since 1914. The zoo spans 56 acres and is home to 9,000 animals and 750 species. The zoo is one of the first “cageless” zoos in the United States and has received numerous awards for captive propagation. It is also home to one of the largest bird collections in the country. The San Antonio Zoo is visited by nearly 80,000 school children and 1,00,000 guests throughout the year. The zoo is open 365 days rain or shine! Here are some great tips to follow when planning your San Antonio Zoo visit. Get there early to make sure that you get free parking. Try to park close to the entrance. The zoo accepts credit cards so there is no need to carry cash, which you may be more prone to losing during your long day there. Make sure to bring sunscreen! If you plan to go to swim at the beach area in The Nature Spot don’t forget to bring towels and an extra change of clothes for the little ones. Remember not to feed the animals unless it is one of the designated areas in the zoo. Make sure to wear comfortable shoes and clothes! Outside food or drinks are not allowed in the zoo for safety reasons! The only exceptions are: bottled water, small snack-sized items, baby food and baby formula. Make sure to respect all of the animals, after all you are entering their home. Choo! Cho! Calling all Train lovers! You can purchase your train tickets at the Train Depot Shop located next to the Train Depot Café. Are you a butterfly fanatic? Then this is the perfect exhibit for you. Guests will never forget their trip to the butterfly garden. The impressive butterflies are flying freely and will interact with you and your family. The colorful creatures will most likely flutter by to say hi and may even rest on your shoulder. This experience allows guests to gain a better understanding about butterflies. Hours: 9 a.m to 5 p.m daily. Lory Landing is one of the Zoo’s most famous attractions. 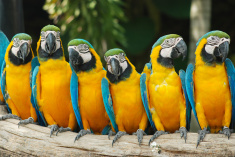 Lory Landing is an Australian rainforest environment that engages guests with hundreds of radiant and outgoing parrots. Guests are able to purchase a cup of nectar and feed the parrots who may rest on a guest’s shoulders or head! Lories are a group of medium-sized parrots that are native to Australia, New Guinea, and other islands near the south Pacific. They usually live in rainforests and primarily fast on nectar, pollen, fruit and flowers. The nectar cups are $1.50 each and you can purchase them near the Lory Café. Lories are extremely social birds and usually travel in groups or pairs. These small birds are strong fliers and acrobats! There are about 53 different species of lories and they come in a wide variety of vibrant colors. Don’t be surprised if they do a trick or two when you visit them! Lori Landing is open from 10 a.m. to 4 p.m. daily! This year, the Zoo will open a revamped giraffe exhibit. This renovation has taken the San Antonio Zoo nearly three years to open. The Zoo has worked very hard to make sure that the scenery is up to par! They have created a naturalistic exhibit with limestone cliffs that will be the backdrop to this exciting new attraction. We will be able to meet and feed these gorgeous animals while they are able to live in a clean and safe environment. Africa Live! is the Zoo’s newest exhibit and it offers guests the chance to familiarize themselves with Africa’s plants, animals and people. While Africa is known for its amazing culture, people, animals, and plants, few people will have the opportunity to visit this extraordinary continent. However, the Zoo has done a fantastic job of replicating the African terrain and bringing over a few exotic animals that call Africa home. Make sure to visit the hippos, crocodiles and African cichlids from Lake Tanganyika and Lake Malawi. They are visible through the underwater viewing windows. Welcome to Africa in San Antonio! The Amazon River Basin is home to the word’s largest and most famous rainforest. It houses more species of plants and animals than any other ecosystem on the planet. The Amazonian exhibit at the San Antonio Zoo is home to large and small cats, such as the jaguar and the ocelot. Other animals in the exhibit include: cotton-topped tamarinds, marmosets, capuchins, white-faced Saki monkeys, armadillos, bats, fish, and birds such as the colorful macaws and the giant Andean condor. You will be also able to visit the smallest of the New World monkeys at this exhibit. Have a laugh as you watch a family of spider monkeys swing from tree to tree or stop and smell the unique aroma of the bromeliad plants. This post brought to you courtesy of The Castillo Group, serving the greater San Antonio area and surrounding Hill Country. Looking to buy or sell your home? Give us a call at 210.410.5556 !